The Nightingale, a summer visitor to southern England, has become more scarce and localised in recent years, having once been found as far west as Wales. We might have expected that with climate change these shy (in Britain, at least) little birds would be breeding in suitable habitats further north, but records show that their range has actually been shrinking. Nightingales are about 16cm long with a typical wingspan of 25cm - somewhat larger than a Robin, therefore. The males and females are very similar in appearance but far from distinctive, with plain brown upperparts and a rust coloured rump and tail. Their underparts are a pale buff colour, while the breast and flank are sandy. The head is rusty brown with a white chin and throat and dark-brown eyes each surrounded by a white ring. The legs and feet of adults are pinkish brown. Juvenile are paler than the adults. Nightingales have reddish-brown (rufous) tails. As with most birds, it is the male Nightingale whose surprisingly powerful song is so renowned for its tonal range and variety. It is true that Nightingales often sing at dusk and into the night (as well as during the day); however, so also do some other songbirds including the Robin and the Blackbird. in Britain the Nightingale is at the north-west limit of its range and can be found south of a line from the Severn Estuary to the Wash. Their greatest concentrations occur in Norfolk, Essex, Suffolk, Kent and Sussex. Although quite rare in Britain, where about 4000 pairs breed, on mainland Europe the Nightingale population is counted in millions. Nightingales build their nests among leaves either on or near to the ground among dense vegetation, using as nesting materials dead leaves and grass lined with feathers and hair. In Britain they produce a single brood, usually laying four or five olive-green eggs. During the two-week incubation period the female sits on the eggs and the male brings food to her. Nightingales fly south during July, August and Early September. By the end of September these lovely birds have flown to their wintering habitats in southern Africa. 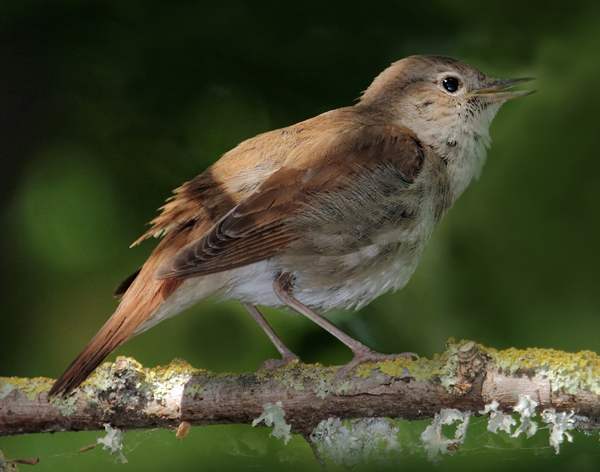 In spring and early summer Nightingales feed mainly on a wide range of invertebrates including spiders, beetles, flies and worms and spiders, later in the year supplementing this carnivorous diet with vegetarian content comprising seeds and small ripe berries. In Britain the Nightingale is a bird of conservation concern and is included in the Red List. Elsewhere in Europe, however, this is a species of least concern from a conservation viewpoint. In common with other smallish birds, Nightingales are preyed upon by larger birds such as Sparrowhawks; however, their habit of skulking in dense vegetation means that they are not easily spotted by predators..
BirdLife International (2012). 'Luscinia megarhynchos'. IUCN Red List of Threatened Species. Version 2013.2. International Union for Conservation of Nature.